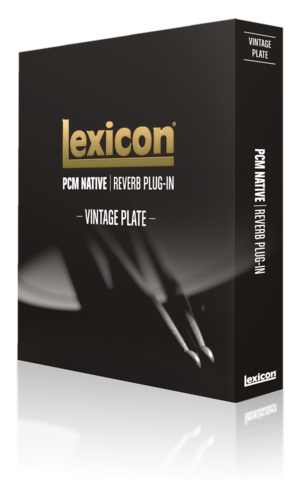 Drawing upon over thirty-five years of being the audio industries pre-eminent maker of hardware digital reverb and multi-effects units, the Lexicon® Native Vintage Plate Reverb is in a class of its own. From the Lexicon® 224 to the PCM 96, our plate reverbs have been used to define the sound of thousands of albums and now you can apply these world class algorithms to your mixes through this powerful plug in. 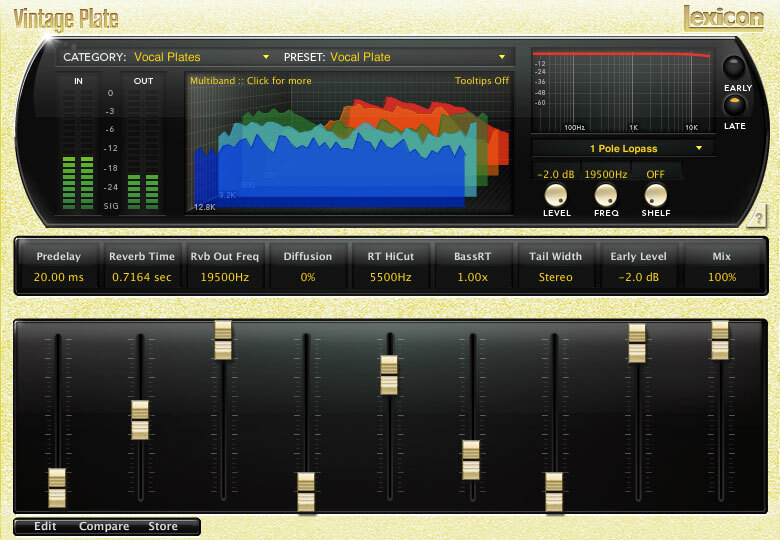 The Lexicon® Vintage Plate algorithm mimics the sound of plate reverberators, but it differs from the Plate algorithm in that it has characteristics of older plate implementations, the updated equalization touches from the PCM96 plate, different input diffusion, and an additional pair of echo voices. With high initial diffusion, a relatively bright, colored sound, and vintage character, the Vintage Plate plug-in is well suited for percussion and vocals and is useful for all popular music. A plate reverb sound is generated by projecting a signal onto a large, heavy plate of metal and capturing the vibrations on the other end. The first widely used plate reverb unit was developed and produced by German phonograph manufacturer 'EMT'. They produced a beautiful sound that was superior to any spring reverb by most standards, but the units themselves were highly cumbersome - often weighing as much as 600lbs and they required tuning that could take hours! Plate reverbs gained popularity in the late 1950's and continued to be utilized heavily well into the 1970's. Many of the biggest records of the period used some form of plate reverb. Lexicon® plate reverbs have been used on thousands of records from the late 1970's on. The PCM Native Vintage Plate is the logical continuation of Lexicon’s Plate Reverb heritage. The PCM Native Vintage Plate Reverb is also available as part of the TEC Award nominated PCM Native Reverb Bundle. For other variations on Lexicon® Vintage Plate Reverb, please look at the PCM and MX hardware series or the MPX, LXP or PCM Native Plate Reverb plug-Ins.